A call went out on social media to help fork the pitch at Droyslden Football Club. I arrived at the Butchers Arms and spotted a group of men already on the pitch. As I walked towards them they shouted “come and help us love” so I put on my pink wellies and did just that. They appeared surprised for a moment and then welcomed me. They were wrestling with an extremely large sheet of plastic which was tangled and full of water. Billy one of the other volunteers explained that there was a match tomorrow but the wind had blown the coverings off and the pitch was water logged in the centre. 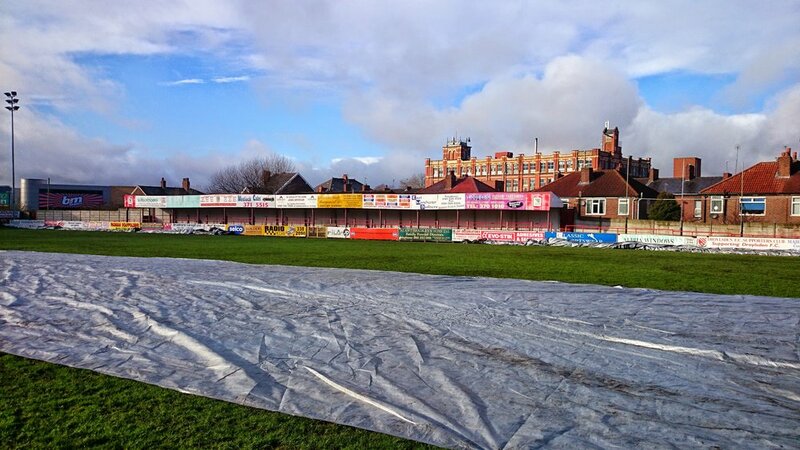 Snow was on its way and the ground needed protection from further damage. The volunteers had hoped to help drain the pitch but the centre was extremely marshy and would need a couple of days of dry weather with wind preferable. That wasn’t the forecast so protection was the only real option. As we untangled the knotted covering I spoke to the volunteer next to me. Billy had volunteered on and off for ten years for the club and now came down three days a week helping with the dressing rooms and preparing the pitch. He was a supporter of one of Manchester’s premier league clubs and had followed them around the country. When his son became ill he came along to his local club and they treated his son really well. Billy said it was like a family and you met people on the terraces and saw them again each week. He enjoyed volunteering to help the club and his children helped out too even though they were now grown. The covering was extremely heavy but many hands make light work and we untangled it together and then grabbed a cup of tea. The volunteers discussed previous matches, players and strategy as we drank our tea and some had Bovril or was it OXO? I was a bit confused about the drink and the conversation but it was nice to enjoy a drink on the side of the pitch. We went back to work and dragged the covering into the centre of the pitch. I laughed as we waded through the mud because I had the image of falling and the entire sheet going over my head. I didn’t and it didn’t. As we cleared other parts of the pitch I met James a new volunteer to the club. He explained that he wanted to volunteer because this was real football and echoed what Billy had said about bigger clubs not caring as much for the fans. James said he would like to volunteer more in the future. Billy took the time to give me an in-depth lesson in dealing with diverts. He explained that the volunteers helped with the pitch maintenance, put up the nets, cleared the changing rooms, stewarded and helped with hospitality. I thought about the amount of people that must do this for the big clubs. It was looking as if the match was going to be off due to the state of the pitch but that would be the referee’s decision tomorrow. Ian, one of the volunteers, was disappointed that they hadn’t managed to get the pitch match ready but thought they had probably done enough to save the pitch for the season. I felt the atmosphere that Billy described of a family and the banter had picked up as we walked off the pitch. Billy said the referees had thanked the ground staff volunteers in the past for the pitch but their true reward was a match going ahead because of them. The sun was coming out which was pleasant. Someone shouted “quick take the cover off again”. I had a feeling that the sun was only temporary. It was confirmed because as I left the ground it started to snow. Just in time. I wrapped my new club scarf that I was given around my neck and smiled. Like the countryside volunteers this was a lot of work that people probably didn’t realise happened but just think how many local sporting events just couldn’t happen without the dedication of the volunteers and the passion of the fans.